Since, the first EclipseCon in 2004, that was held in Disneyland, Eclipse had a conference in US. I missed all the Disney music of 2004 and my first EclipseCon was in 2005 but I have presented on various EclipseCons since then. Throughout these years, I was able to observe the variances on interests for EclipseCon audiences. However it is a challenge to form an EclipseCon program that is equally interesting to developers of Eclipse technology and Eclipse users. This year the job had become a bit easier, to serve varying interests EclipseCon is teaming up with Devoxx US and becoming Eclipse Converge. 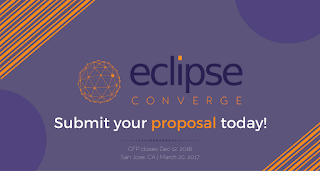 As part of the program committee for Eclipse Converge, my goal is to shape a program in the spirit of the early EclipseCons where the talks would be concentrated around building and innovating on Eclipse projects. If you have talks that are deep in Eclipse technology, please submit them. At least I will be voting for them. And who knows we can bring the Disney music back to EclipseCon next year! Before I go into the details of integration let me quickly introduce the parsers that I have tried. Shift(java) is the only Java based parser on my list. It is a relatively new parser. It uses Shift AST as its model which is different from the widely adopted ESTree. Why does AST model matter? Eclipse JSDT already comes with a JSDT AST model that is used internally that is very hard to replace. Therefore, regardless of the AST model generated by the parser it will be converted to JSDT’s own model before used. Which renders discussions around the AST models moot in JSDT’s context. The parsers other than Shift, which already runs on the Java VM, need a mechanism to play nice with the Java VM. I have experimented with 3 mechanisms for running Acorn and Esprima for JSDT so far. Utilizes node.js to run the parser code. node.js runs as an external process, receives the content to be parsed and return the results. I have chosen to use console I/O to communicate between node.js and Java VM. There are also other techniques such as running an http or a socket based server for communication. In order to avoid the start up time for node.js, which does affect the performance significantly, node.js process is actually kept running. The criteria for choosing a parser may vary from the feature set, to AST model used, to even community size. However performance is the one criteria that would make all others relevant. So in order to compare the performance of different alternatives I have developed a number of benchmark tests to compare parsers and the mechanisms. As expected Shift parser which runs directly on top of JavaVM is the quickest solution. To be fair, Shift parser is missing several features such as source location, tolerant parsing and comments that may affect the parsing performance. However even after these features added it may remain the quickest. I feel that the performance for J2V8 can also improve with more creative use of the low level APIs however there is so much memory copying between Java heap to JNI to V8 heap and back I am not sure if it would be significant. The surprise for me is the Esprima’s performance with Nashorn. It is unexpected in two ways. It is actually the third quickest option however Acorn does not give the same level of performance. Apache Cordova command line tool(CLI) provides a unified way to manage and build mobile applications across platforms. Unfortunately, it is not always possible to provide configuration options generic enough that span all supported platforms. For those cases, Cordova takes a platform specific approach. Here is a small guide for 5 of these less known configuration options. All of these options are managed on the config.xml file on your project. As attributes of the root widget node. Normally, the the package name for an Android application is generated from the id of the Cordova application. Presence of android-packageName on the config.xml causes the package name on AndroidManifest.xml and java package name for the activity class to be generated from its value. The android-activityName attribute allows the main activity name to be specified. Activity name is one of those things that cannot change in Android. Therefore this feature becomes useful when renewing an older implementation with a Cordova based one or upgrading between Cordova versions that have different default activity name values. Sets the versionCode value on the application’s manifest file. If android-versionCode is not specified versionCode is generated to have the default value of 1. If you are wondering why the default value is 1 instead of the value of the version attribute, this is because versionCode is restricted to be an integer. ios-CFBundleIdentifier determines the value of CFBundleIdentifier key in the Info.plist file of your application. This key is the unique identifier for your application on the system. If ios-CFBundleIdentifier is not specified the value of the id field will be used when generating Info.plist. This is the iOS cousin of the android-versionCode explained earlier. They pretty much serve similar purpose on their respective platforms. You should be aware of the quirks when defining the value. If ios-CFBundleVersion is not specified the value of the version attribute is used for generating the iOS application. You can now try the Red Hat Mobile Application Platform (RHMAP) yourself. This is the platform that Red Hat acquired last year and now there is a version of it running on Openshift online. If you have an Openshift online account, browse to openshift.feedhenry.com and request your invite. Both Openshift online and RHMAP invite are free. As a bonus, here is a video that shows how to use JBoss Developer Studio 9 and RHMAP together to build Apache Cordova based applications.